अब समझिये बातों को .. ये स्तम्भ हिन्दू बनवाते थे.. जबकि मुस्लिम इसको तोड़ते थे.. उदहारण के लिए कुतुबुद्दीन ऐबक ने जैन मंदिर परिसर के 27 मंदिर तोड़े जिनमे ऐसे स्तम्भ होते थे ...तब यह स्तम्भ क्यूँ छोड़ दिया .. ? जब वो ऐसे स्तंभों को तोड़ते थे तो क्या कुतुबमीनार के अन्दर ऐसे स्तम्भ को बनाया था ? या इस स्तम्भ को ना तोडना मज़बूरी थी क्यूँ कि यह स्तम्भ समय बताता था जो खुद के लिए रखना जरुरी था ? Qutubuddin has left us an inscription that he destroyed these pavilions. But he has not said that he raised any tower. The ravaged temple was renamed as Kuwat-ul-Islam mosque. 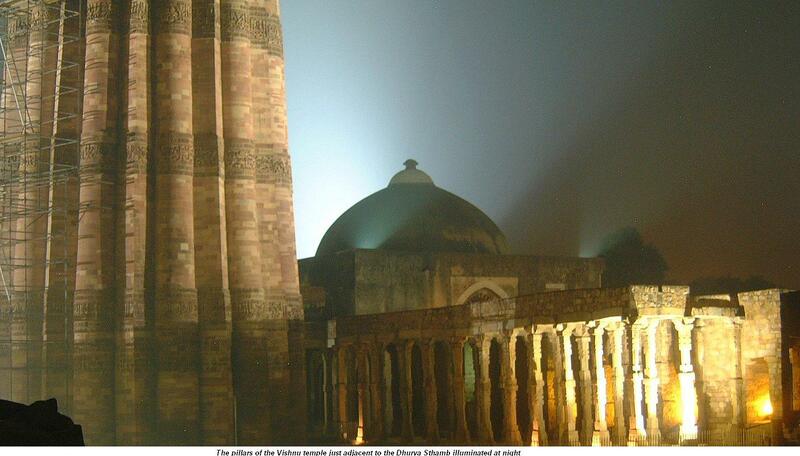 Stones dislodged from the so-called Qutub Minar have Hindu images on one side with Arabic lettering on the other. Those stones have now been removed to the Museum. They clearly show that Muslim invaders used to remove the stone- dressing of Hindu buildings, turn the stones inside out to hide the image facial and inscribe Arabic lettering on the new frontage. The tower is but a part of the surrounding structures. It is not that while the temples around are earlier Hindu buildings there was sufficient space left in between for Qutubuddin to come and build a tower. Its very ornate style proves that it is a Hindu tower. Mosque minarets have plane surfaces. Those who contend that the tower was meant to call the Muslim residents to prayer have perhaps never tried to go to the top and try to shout to the people below. Had they done so they would have found out for themselves that no one on the ground can hear them from that height. Such absurd claims have been made to justfy Muslim authorship of earlier Hindu buildings. The frieze Patterns on the tower show signs of tampering, ending abruptly or in a medley of incongruent lines. The Arabic lettering is interspersed with Hindu motifs like lotus buds hanging limp. Sayyad Ahmad Khan, a staunch Muslim and a scholar, has admitted that the tower is a Hindu building. If one were to hoover in an aeroplane over the top of the tower the various galleries sliding into each other from top to bottom appear like a 24-petal lotus in full bloom. The figure 24 being a multiple of 8 is sacred in Vedic tradition. Even the brick red colour of the tower is sacred to the Hindus. The Hindu title of the tower was Vishnu Dhwaj (i.e. Vishnu’s standard) alias Vishnu Stambh alias Dhruv Stambh (i.e., a polar pillar) obviously connoting an astronomical observation tower. The Sanskrit inscription in Brahmi script on the non-rusting iron pillar close by proclaims that the lofty standard of Vishnu was raised on the hillock named Vishnupad Giri. That description indicates that a statue of the rec- lining Vishnu initiating the creation was consecrated in the central shrine there which was ravaged by Mohammad Ghori and his henchman Qutubuddin. The pillar was raised at the command is an ancient Hindu king who had made great conquests in the East and the West. The seventh storey had actually a statue of the four-faced Brahma holding the Vedas at the beginning of creation. Above Brahma was a white marble canopy with gold bell patterns laid in it. The t top three stories were in mle. They were ravaged by iconoclastic muslims who detested the Brahma statue. The Muslim raiders also destroyed the reclining Vishnu image at the bottom. On one side was an elliptical enclave formed by 27 Nakshatra (constellation) temples. A gigantic red-stone, ornate gate- way led to the sacred enclave known as Nakshatralaya. Therefore gateway is traditionally known as Alaya-Dwar. Cunningham twists the traditional Hindu name to fraudulently ascribe the great doorway to Sultan Allauddin though Allauddin himself makes no such claim.